Heat Pumps are becoming increasingly accepted as a means of heating homes without relying on burning fossil fuels. For anyone who hasn’t had first hand experience of a water source heat pump or any other heat pump, the concept is simple. In the case of ground source, collector loops circulate a glycol/water mix (brine). Energy is absorbed by the brine, typically around 5˚C, and delivered to the heat pump inside the building. Once the energy has been extracted by the heat pump the brine is returned at around 0˚C to start the process all over again. Where sufficient land is available to install ground loops, the ground array will consist of a number of circuits connected to a manifold. A pair of header pipes link the manifold to the heat pump within the building. The collector pipes are buried at a depth of at least one metre, where the soil temperature remains stable across the seasons. All energy we extract is ultimately derived from the Sun, and this extracted energy is replaced as rainwater percolates through the soil. The design of the ground loop system considers the amount of energy required by the property, and the ground conditions together with local ambient temperatures. 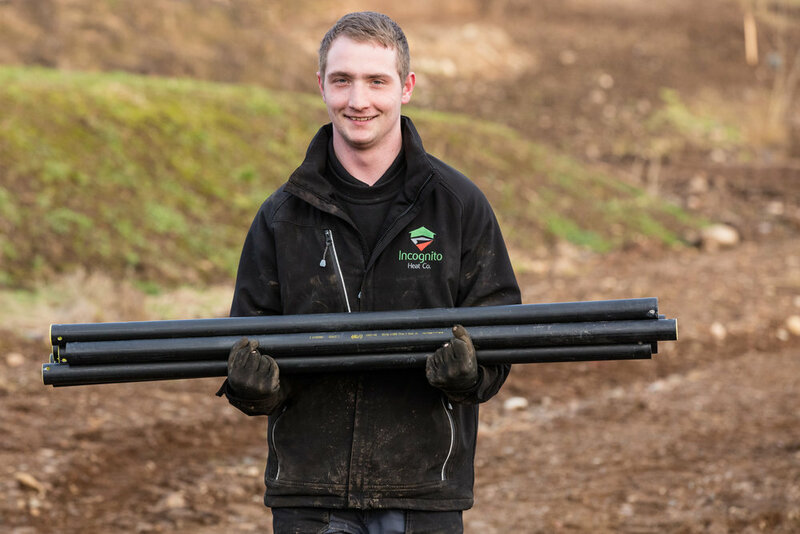 In addition to burying pipework in earth, collector pipes may also be installed into a loch, or lake. The customary method of installation is a closed loop system. As the name suggests, the brine circulates through a sealed system and there is no interchange between the loch water and the brine circuit. Energy extracted by the water source heat pump is replaced by water flowing into the loch, and solar energy falling on the surface of the loch. In the winter, temperatures in a lake get close enough to freezing that the colder water is less dense and floats to the top. The water temperature a the bottom of the loch, where he collector pipes are remains pretty much constant at a temperature of approximately 4˚C. A recent project took us to a new build house in Perthshire, Scotland, being constructed within a few hundred metres of a small loch. The available land was considered, and the local loch was presented as a possible heat source. Water is an excellent medium for collecting energy from, and this arrangement made it possible to install the complete collector array with minimum disturbance. Ground loops now more accurately described as loch loops are arranged on land where weights are attached. The loops now take on the appearance of a rope ladder, the rungs adding ballast and serving to keep the pipes apart. 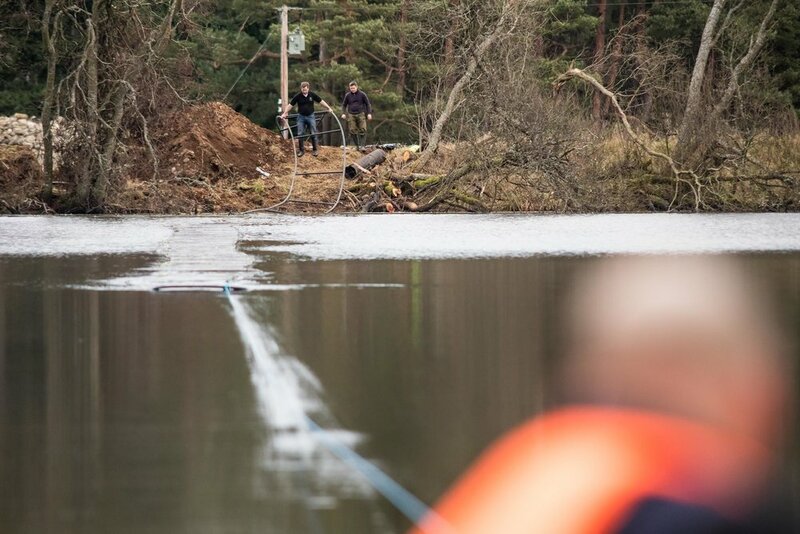 During installation, our team typically takes a rowing boat out to carry a light rope across the loch, where others of the team wait on the opposite side to reel it in and tow the loch loops out into deep water. Before the pipes are filled, there is enough positive buoyancy to cause the loops to float. Having pulled the loop into the loch to its full extent the loop can be maneuvered into position and the ends of the loops are fusion welded to the manifold on the banks of the loch. Pumping the glycol-water mix into the pipes has the effect of overcoming the natural buoyancy of the pipe, and the loops sink to the bottom of the loch. Once landscaping is completed and land reinstatement has taken place only the lid of the manifold chamber on the bank reveals the existence of the collector system. The design of a ground heat exchanger is a complex engineering procedure. Typically, a conservative approach is adopted and early dialogue with us is important to confirm the suitability of a particular tract of land or water source as an energy source before work starts. For those without packages of land attached to their houses, or access to a loch, do not despair. See our pages on air source heat pumps. For another project in Perthshire: Underfloor Heating Perth. Drone images and video: MadeByDrones. Can Heat Pumps Give You Great Value For Money? Renewable Heat Incentive scheme further improved!